Geophysicists have disproved a long-held belief that changes in solar activity can be linked to increased earthquake activity. Researchers at the United States Geological Survey (USGS) studied the different phenomena thought to prompt seismic activity. 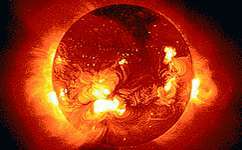 One theory is that a rise in solar activity, like sunspots, solar wind speed, or magnetic storms could trigger more, or larger, earthquakes. 'Recently there's been a lot of interest in this subject from the popular press, probably because of a couple of larger and very devastating earthquakes. This motivated us to investigate for ourselves whether or not it was true,' says Dr Jeffrey Love from the USGS, lead author of the study. But when Love and his colleague, Dr Jeremy Thomas from Northwest Research Associates, examined the relationship between peaks in solar activity and large earthquakes, they found there was no correlation at all. 'There have been some earthquakes like the 9.5 magnitude Chile quake in 1960 where, sure enough, there were more sunspots and more geomagnetic activity than on average. But then for the Alaska earthquake in 1964 everything was lower than normal. There's no obvious pattern between solar activity and seismicity, so our results were inconclusive,' Love says. The pair used data from the British Geological Survey, USGS, NASA and the National Oceanic and Atmospheric Administration to count the number of earthquakes per day, month and year. They then ranked these counts depending on how much solar-terrestrial activity had occurred at the same time. They showed that there are just as many earthquakes whether or not there is lots of solar activity. 'From previous work we had found that ground sensors in the vicinity of earthquakes did not show any "precursory" signal that might be used to predict an earthquake. Still, some historical and some recent studies seemed to indicate a solar triggering of earthquakes, so we decided to investigate this as well, explains Love. The theory was first proposed in the late nineteenth century by Rudolf Wolf, a Swiss astronomer known for his research into sunspots. Love understands why people might believe there is a correlation between the two phenomenon. 'It's natural for scientists to want to see relationships between things' he says. "Of course, that doesn't mean that a relationship actually exists!" This story is republished courtesy of Planet Earth online, a free, companion website to the award-winning magazine Planet Earth published and funded by the Natural Environment Research Council (NERC). Can't say I'm surprised. What do you think Cantdrive85? Well, I, for one, am "shocked".